I get an e-mail from his little brother, Xander, who is now 32, to say that he enjoyed the piece, and so did his parents. I am delighted. I had worried. It’s 20 years since I spoke to them. 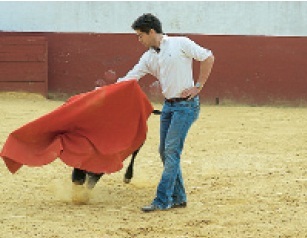 Xander says he is living in Seville, and training to become a bullfighter. I say that sounds dangerous. I’ll come out and see him before he dies. 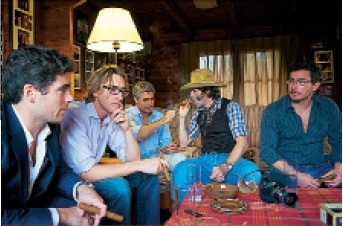 And so this Adolfo character takes Xander under his wing, and introduces him to the great Juan José Padilla (reputedly the bravest living matador, killer of the most dangerous bulls) and Xander also befriends the matador Cayetano (great-grandson of Cayetano Ordóñez, one of the inspirations for Hemingway’s Fiesta) and scores of other people, all with a dozen names each. On the morning of July 5, I fly to Barcelona and meet up with Xander for a long lunch. 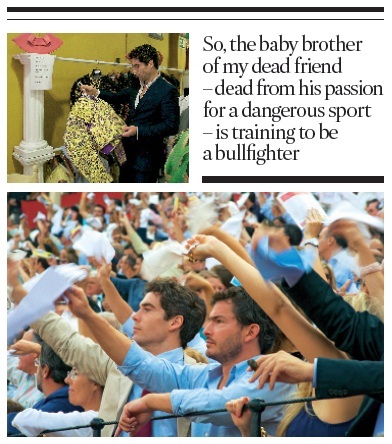 We talk about what we expect from Tomás, from the bulls, from the crowd. We may be about to see the greatest fight in the history of Spain. Obviously, I do not want Tomás to be killed. 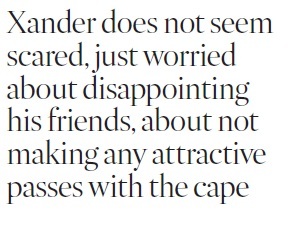 The whole thing is that you don’t want the matador to be killed. But it would be damn handy for the article. I’m staying at a hotel owned by the Duke of Segorbe, who knows Xander for some reason, and on the first night am introduced to his tertulia (a sort of salon) in one of the drawing rooms there. We shake hands and I have half an idea that he is called Ignacio, and is the husband of Princess Gloria de Orléans-Braganza, who is the cousin of Princess Gerarda de Orléans-Borbón (Nicolás Haro’s mother-in-law; her cousin, Jean d’Orléans, the Duke of Vendôme, laid claim to the throne of France in October this year), at whose home in Sanlúcar de Barrameda we will be staying the following night, and whose son-in-law will be taking our photos. “Yes,” he says. “I walked in here the first time and said to myself, ‘Here, I can write.’” But then, luckily, he laughs. Later that night, we arrive at El Botánico, a vast botanical garden occupying a huge chunk of the town of Sanlúcar de Barrameda. A palace. A cab driver reluctant to go in through the iron gates. Very good tortilla left for us by the princess’s cook. An octagonal drawing room. Cool bottles of the family manzanilla, bearing the Orléans-Borbón coat of arms. Or rather, I retire early. Xander, it transpires in the morning, has trouble sleeping. He finally nods off about 6am. He dreams that Adolfo is telling him, “Be ready to be ready” (in fact it was Mani, the old tout, who very helpfully spent two hours haranguing Xander about the importance of being prepared). He also dreams that Padilla was asleep in his father’s bed, Adolfo in Jules’s. We smoke big Dominican cigars and drink rum, and try not to mention (assuming we all notice) the grim smell of Spanish plumbing. 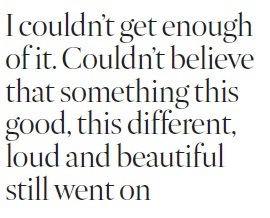 Giles Coren – who I recently had lunch with for his Times restaurant column earlier, our first meeting since this article – has since married his then girlfriend, the journalist Esther Walker, and they have had a daughter. 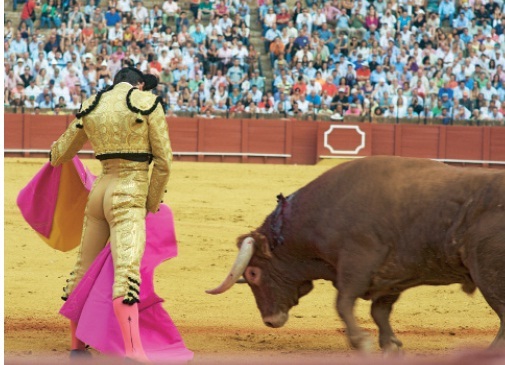 He has not seen another bullfight since his visit. Dominic Elliot – who I am spending New Year with – has also since married his then girlfriend, the portrait painter Arabella Dorman, and they have also had a daughter. 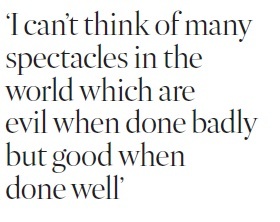 He also has not seen another bullfight since. 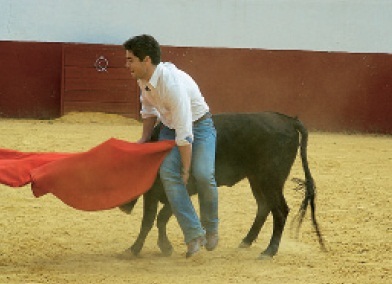 Adolfo Suárez Illana killed his bull at the festival in Castellón with great skill and art – I was in his cuadrilla, his ‘team’ – and was awarded both ears and the tail of the bull by the president of the ring. He has since retired from public bullfighting, although he long ago promised Padilla he would return for one last public fight with him. 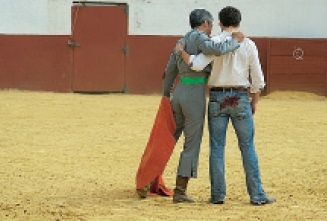 Juan José Padilla was gored the next day in his fight in Granada, but he recovered. I saw him fight in Seville in 2010 and again this year. 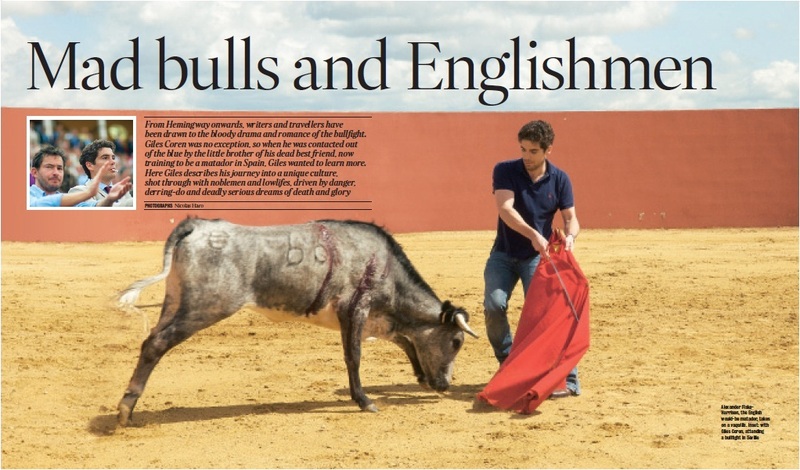 I also saw him this year Pamplona with a 700kg bull – which I ran with in the streets that morning. 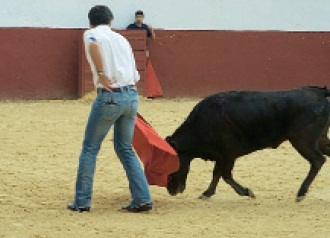 However, in October he received the worst goring any matador has ever received and lived. Despite the terrible injuries, including the loss of an eye, he has vowed to return to the ring. This entry was posted in Adolfo Suárez Illana, Books, Bullfighting, Ernest Hemingway, Juan José Padilla, Seville, Spain and tagged Adolfo Suárez, Alexander, animal rights, animal welfare, anti-bullfighting, arabella dorman, ban, barcelona, borbon, british, bull, bull-fight, bull-fighting, bullfight, bullfighter, bullfighting, bullfighting ban, bulls, cayetano, claire danes, corrida, english, esther walker, face, Fiske-Harrison, fran, francisco, giles coren, gored, goring, head, hugh dancy, into the arena, Juan José Padilla, killed, matador, ordonez, orleans borbon, Padilla, Paquirri, pro-bullfighting, profile books, Rivera, seville, Spain, sports book of the year, sports journalism, sports writing, suarez illana, tauromachy, tauromaquia, the times, toreador, toreo, torero, toro, toros, william hill, World Of The Spanish, xander by fiskeharrison. Bookmark the permalink.